Cell Phone In The Lake? Plop! That’s the sound of a phone falling in the water, something as boaters we're likely all too familiar with. Next time it happens, you can be rewarded! Ting Mobile, a highly-rated mobile service provider that loves to save consumers money, recently surveyed over 1,400 phone users revealing the most common phone faux pas and divulging consumers’ willingness and confidence levels around repairing their own devices. As a result of the findings which include 51 percent of respondents say they have lost a phone to water or liquid and 69 percent of people would prefer to repair their phone rather than buy a new one, Ting has taken a stand supporting Right to Repair and launched a Broken Phone Payback Program, rewarding people who choose to have their device repaired instead of buying new. Did you know that you have a “Right to Repair” your tech items? According to results from the “Epic Phone Fails” survey released today by Ting Mobile, a top-rated postpaid MVNO mobile phone service, 78 percent of people are unaware of their “Right to Repair.” With the average cost of a screen repair running just $113, consumers who purchase a new phone could be saving a lot of money if they’d just fix the screen instead. Ting Mobile, a phone service that helps customers save money on their mobile phone bills by only charging people for what they actually need, released the survey data today and announced a new social campaign and promotion that support people’s “Right to Repair” the tech items they own rather than letting a broken screen or dead battery force them into purchasing new tech. Key Takeaways: Ting Mobile released data from its “Epic Phone Fails” survey today, revealing the most common phone faux pas and divulging consumers’ willingness and confidence levels around repairing their own devices. ● 64% of people have cracked the screen of their smartphone, and the most likely way it happens is by dropping the phone (62%). ● While 60% of people keep a screen protector on their phone, it doesn’t seem to help as much as you’d hope: 66% of respondents with a screen protector have cracked their phone where fewer respondents, 60% have suffered the same fate without a screen protector. ● 51% of respondents say they have lost a phone to water or liquid, with 30% identifying the toilet as the culprit. ● Sometimes accidents happen when our phones are fully-functioning, too. 76% of people say they have sent a text to the wrong person, with 28% of those messages being about the person they mistakenly sent them to. Yikes! ● 48% of people have sent a text message or photo that they later regretted (for the record, only 26% of those people attribute their poor decision to alcohol, of course, we asked). Collectively, we’re trying to get better: 45% have taken steps to prevent mishaps in the future, with 32% changing the names in their contacts to better distinguish people and 20% blocking certain numbers to prevent them from reaching out. ● 34% of people purchased device insurance to protect their phone, and thankfully 48% of people who have needed to use it found it pretty easy to do so. ● 80% of people who cracked their phone screen had it repaired within a month of the incident. It cost an average of $113 to have the screen fixed. ● 69% of people said they would prefer to either repair their own phone or pay to have someone repair it than to buy a new phone to replace the broken one. ● 66% of people report that they have repaired an electronic on their own, but only 11% of those people repaired a smartphone. ● If armed with a repair kit and good YouTube tutorial, 35% of people would feel comfortable replacing their phone’s battery, while 27% would have the confidence to replace the phone screen. ● 64% of people said they would buy a DIY phone repair kit if a phone manufacturer offered one. 58% of people said they would be more likely to buy a phone from a manufacturer that offered a DIY repair kit. The Ting Phone Fails Survey was conducted in March 2019 and includes responses from 1,432 mobile phone users. To read more survey results, visit ting.com/blog/phonefailssurvey. Ting wants to hear about your #epicphonefails on social media and today launched a social campaign where people can share their funny and cringe-worthy stories about the time they sent a text they shouldn’t have or jumped into the pool with their brand-new phone in their back pocket. To share your #epicphonefails, use the hashtag on Facebook, Twitter or Instagram and tag Ting or visit the Subreddit. Then, check back at www.epicphonefails.com to see the best-of-the-best featured. To further support their mission of helping customers save money on their mobile bills, Ting introduced the Broken Phone Payback program today. New customers who bring a recently repaired phone to Ting will receive up to $150 in credit toward their phone bill when they provide the receipt for their phone repair. Existing customers who add a new phone line with a recently repaired phone can enjoy the same offer. “We know that many mobile providers make it difficult for customers to repair a phone and instead push for them to purchase a new or refurbished device. At Ting, we give you the flexibility to BYOD (bring your own device) and now we’d like to reward people who choose to have their device repaired instead of buying new,” said Moore-Crispin. To take advantage of this offer, customers can have their device repaired at any repair shop and must be able to provide a copy of the receipt. When the customer signs up for a new Ting account or adds a line to their existing account, Ting will round up the amount the customer paid in repairs to the nearest multiple of 30 ($30/$60/$90/$120/$150) and credit the customer’s account with that amount. This credit will be applied against the customer’s bill in installments of $15/month until exhausted. To learn more about the Broken Phone Payback from Ting, visit start.ting.com/repairphone. 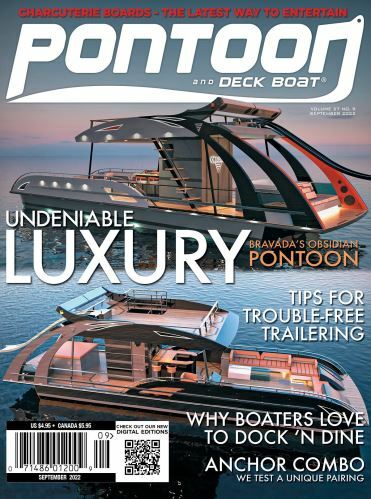 Copyright © 2019 Pontoon Deck Boat | Published by Harris Publishing, Inc.